The only Mel Brooks movie that Randy and I both enjoy is Young Frankenstein and there are a couple of lines in that movie that I love and giggle at every time I hear or think them. I also love the line from Gene Hackman...."an incredibly large mute" and "damn your eyes" line from Gene Wilder and Marty Feldman's response of "Too late". Oh, let's face it I like it all. 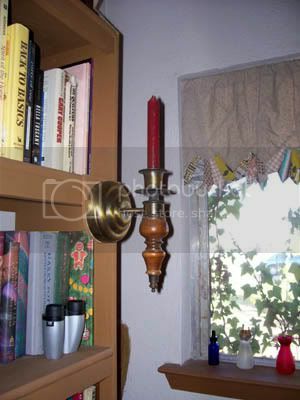 Several years ago I found a pair of wall sconces at a garage sale. I really had no idea where to put them but something told me they would be needed someday. Fast forward to 2005 when the re-construction was completed on this room and we were building the 'incredibly large' bookcase together....for some unknown reason the bookcase in that movie came to mind and the line....."Put the candle back" that Terri Garr's character said when trapped behind the bookcase came to mind also. We had the sconces and the movie therefore 'it would work'. Randy recorded that line on a tiny battery powered recorder, put it in one of the sconces and mounted them on either end of the bookcase. Eight feet away from the first one is the candle sconce on the left end of the bookcase. 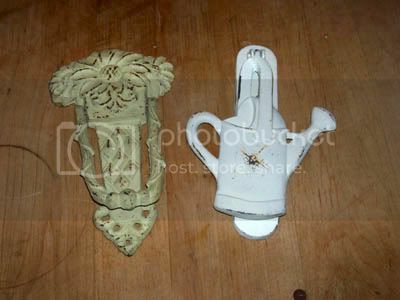 When the candle is lifted out of the sconce you hear Terri Garr's voice saying "Put ze candle back"
These door knockers (two of yesterdays finds) will be attached to the front door after they and the door have been repainted. If you have seen the movie, you will come up with the appropriate lines from the movie to go with these....if you haven't, you really should it is a funny movie. 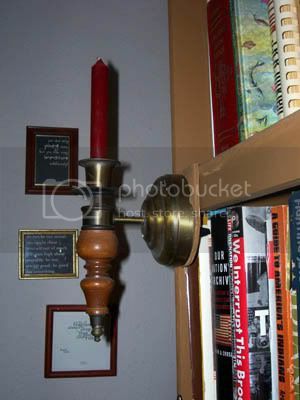 puttind sconces onto a book case but they are very attractive.A talking sconce to funny. ROFL!!!!! Yes, I know the movie well, thanks for the great laugh! What a riot. I have not seen the movie, but just the idea of talking sconces makes me laugh. Thanks for the morning giggle. And now 'talking' projects Toni! What next!? :D Does the novelty wear off or can you just return to it for a giggle now and then? Gosh, such a warped sense of humor you two, hmmm, who else does that remind me of?